Purpose The aim of the study was to evaluate the relation between the photoreceptor inner segment/outer segment (IS/OS) junction integrity and the best corrected visual acuity (BCVA) and color vision after intravitreal injection of antivascular endothelial growth factor, ranibizumab in patients with diabetic macular edema (DME). Patients and methods This prospective observational interventional study was conducted on 50 eyes of patients with DME. All patients received three doses of intravitreal injection of antivascular endothelial growth factor (ranibizumab) 1 month apart. The photoreceptor IS/OS was evaluated by spectral domain optical coherence tomography and correlated to both BCVA and color vision by the Ishihara pseudoisochromatic 38 plates test. Results There was highly statistically significant improvement of photoreceptor IS/OS integrity after the second (P=0.003) and third injections (P=0.000). There were increases in the percentage of cases that read the color test correctly after each injection, but this increase was found to be not statistically significant when compared to color vision before the first injection. The mean BCVA was 0.96±0.09 SD (logarithm of the minimum angle of resolution) before the first injection. There was a highly statistically significant improvement in the BCVA after first (0.78±0.15), second (0.70±0.15), and third injections (0.64±0.16) (P=0.000). There was a statistically significant relation between color vision and IS/OS after the first injection (P=0.047), but it was a highly statistically significant relation after the second and third injections (P=0.000). BCVA was significantly related to IS/OS after the second and third injection (P=0.017 and 0.000, respectively). Conclusion The continuity of the foveal photoreceptor IS/OS layer evaluated by means of spectral domain optical coherence tomography is a valuble prognostic indicator of visual acuity and color vision outcome in patients with DME. Diabetic retinopathy (DR) is the most microvascular complication in diabetics , its spectrum includes diabetic macular edema (DME), which is considered as the serious cause of visual disability in the working age group . Diabetes results in the disruption of the blood–retinal barrier and disintegrates the capacity of neuroglial cells, with vascular endothelial growth factor (VEGF) playing an important role . Clinical observations suggest that visual acuity is a probable multifactorial function that may be related to structural restoration of the foveal photoreceptor which is needed to achieve good visual recovery . Color vision is one of the earliest visual functions to be influenced by diabetes. Diffuse color impairment is a defect in which the refinement along both blue/yellow and red/green axes are affected, such a defect is assumed to be related to inner retinal layers damage . Modern investigative device such as spectral domain optical coherence tomography (SD-OCT) has come to be an essential device in the early diagnosis and following of DME . The integrity of the foveal inner segment/outer segment (IS/OS) layer (also known as ellipsoid zone) can be precisely evaluated using SD-OCT . Earlier studies found that some eyes with DME have poor visual outcomes, notwithstanding the fruitful treatment and complete resolution of edema . Limited data of the relationship between the foveal ellipsoid layer and visual result in DME is accessible . The aim of this study is to evaluate the relationship between the foveal photoreceptor IS/OS junction integrity and the best corrected visual acuity (BCVA) and color vision after intravitreal injection of anti-VEGF (ranibizumab) in patients with DME. 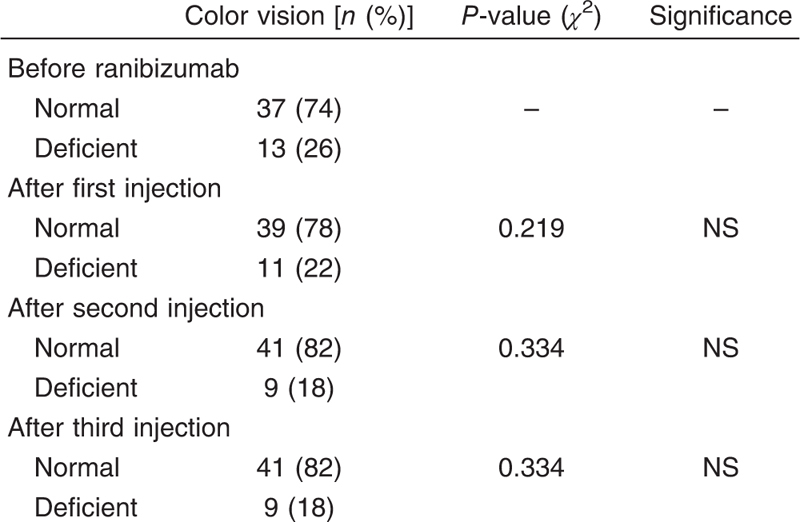 A prospective observational interventional study was conducted on 50 eyes of 44 patients with DME that required intravitreal injection of anti-VEGF (ranibizumab). The protocol of this study was approved by the Medical and Ethical Committee of Ain Shams University. Informed consent was obtained after giving detailed information about the procedure. The inclusion criteria were the patients with type II diabetes mellitus who had DME and aged 30 years or older. The exclusion criteria were the patients with corneal opacities, dense cataract, vitreomacular traction, intraocular inflammation, and ocular infection. Plates 1–15 determine the normality or defectiveness of color vision. If four or less plates are read wrong, color vision is regarded normal. If 5–7 plates are read wrong, patient is suspected of having color deficiency. If eight or more plates are read wrong, color vision is regarded deficient. SD-OCT (3D OCT-2000; Topcon, Japan) using high resolution 12 radial macular scans was done to all patients to evaluate the IS/OS junction and 3D macular map to measure the central macular thickness and retinal volume. OCT image of IS/OS layer was classified into completely visible IS/OS (normal IS/OS group), disrupted IS/OS (disrupted IS/OS group), and loss of IS/OS (lost IS/OS group) within 500 µm from the center of the fovea ([Figure 1]). Figure 1 Grading of inner segment/outer segment junction defect (a) black arrow: intact, (b) yellow arrow: disruption, (c) blue arrow: lost. All patients received three doses of ranibizumab intravitreal injection, with 1 month separation between each injection. Injection was given in the operating room under complete sterile conditions with topical anesthesia (benoxinate) held with a cotton-tipped applicator at the injection site for 1 min The dose of ranibizumab was 0.5 mg. Follow-up visits were done 1 month after each injection. During each visit, we assessed BCVA, color vision, SD-OCT for assessing macular thickness, retinal volume, and the integrity of IS/OS junction. This prospective interventional observational study was conducted on 50 eyes of 44 diabetic patients with macular edema (ME). Patients received three doses of intravitreal ranibizumab injections, 1 month apart. The mean age was 61.30±5.73 SD years (49–73 years). The mean duration of DM was 15.20±5.21 SD (10–30 years). There were 41 (82%) patients with nonproliferative DR and nine (18%) patients with proliferative DR. The blood sugar was not controlled in 24 (48%) patients and was controlled in 26 (52%) patients. 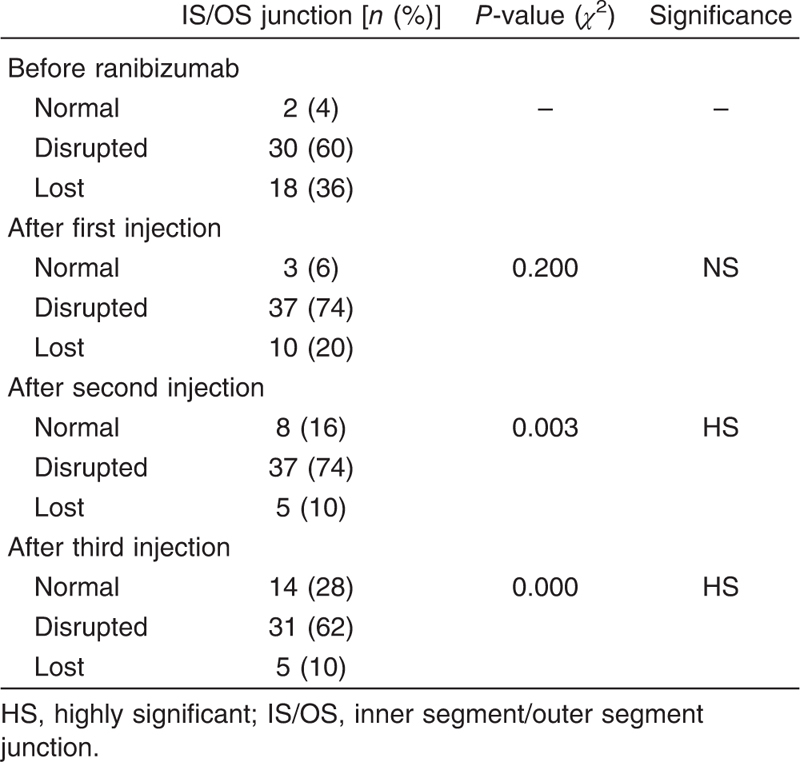 There was no statistically significant difference between IS/OS before and after the first injection (P=0.200), but there was a highly statistically significant improvement in IS/OS after the second (P=0.003) and third injections (P=0.000) ([Table 1]). The mean BCVA was 0.96±0.09 SD logMAR before the first injection. There was a highly statistically significant improvement in the BCVA after the first (0.78±0.15 SD), second (0.70±0.15 SD), and third injections (0.64±0.16 SD) (P=0.000) ([Figure 2]). 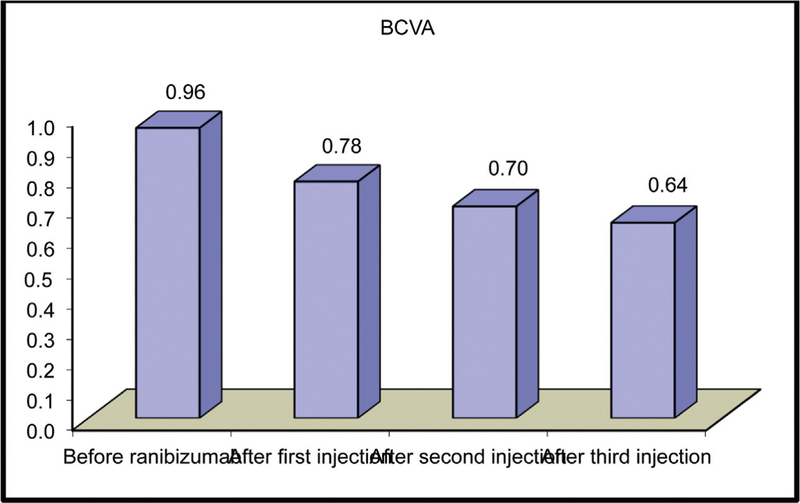 Figure 2 Best corrected visual acuity (BCVA) before ranibizumab and after each injection. 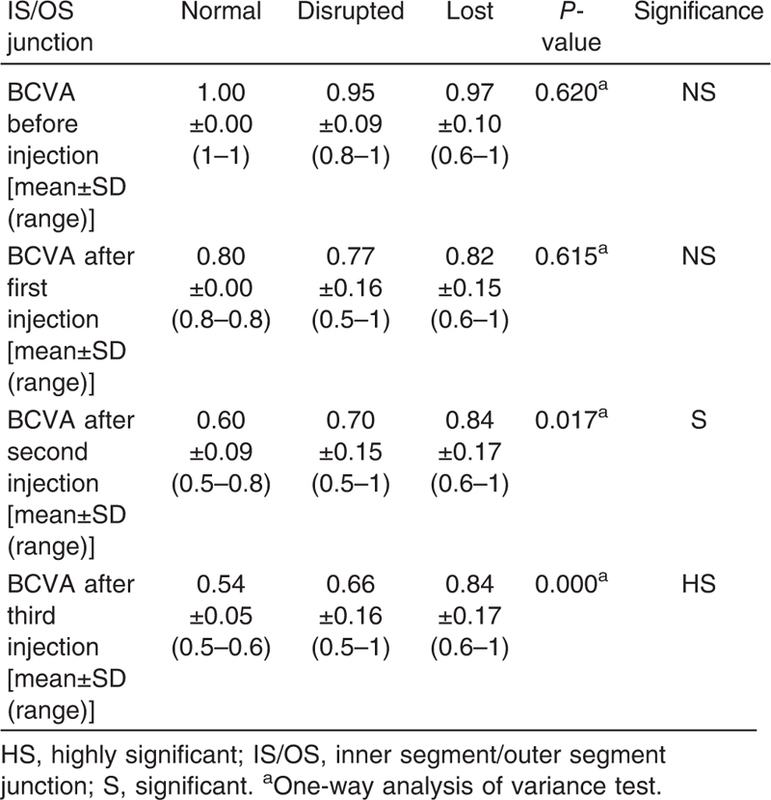 There was a statistically significant relation between BCVA and IS/OS after the second injection (P=0.017) and a statistically highly significant relation after the third injection (P=0.000) ([Table 2]). There was an increase in the percentage of cases that read the color test correctly after each injection, but this increase was found to be not statistically significant when compared to color vision before the first injection ([Table 3]). There was a statistically significant relation between color vision and IS/OS after the first injection (P=0.047) and a highly statistically significant relation after the second and third injections (P=0.000) ([Table 4]). ME is an important cause of severe visual debility in patients with diabetes; even after complete resolution of the edema, many patients still experience poor vision . Regardless of the positive effectiveness of anti-VEGF drugs on VA, it remains largely unclear that how these drugs improve the neuroglial dysfunction in DME . Improvements in SD-OCT technology have increased the understanding of morphological changes in individual retinal layers . This study was directed to answer why some patients with DME get poor visual results, notwithstanding the complete ME resolving. Results of the present study showed significant improvement in BCVA after the second (P=0.017) and third injections (P=0.000) corresponding with improvement of the foveal ellipsoid zone integrity. Our outcomes are reliable with those of a former study by Mori et al. who revised that the re-establishment of disturbed foveal ellipsoid zone after intravitreal ranibizumab injections for DME and VA improvement was positively correlated at a year follow-up. Moreover, earlier studies ,, evaluated the relation between IS/OS and visual acuity, but used different procedures other than ranibizumab injection. They showed that not only the decrease in foveal thickness was adequate to accomplish good visual recovery, but also the restoration of the photoreceptor structure was required. Jain et al. reported that high serum level of both VEGF and intercellular adhesion molecule-1 was correlated with DR severity and photoreceptor layer disruption. This may be an indicator of visual acuity outcome and DR progression. Anatomically, IS/OS is comprised mainly of the mitochondria, hence, it provides higher levels of energy consumption in the photoreceptors, leading to hypothesize that the mitochondrial dysfunction in the foveal photoreceptors results in decreased VA in DME . Anti-VEGF drugs might resolve the foveal cystoid spaces by blocking mitochondrial extravasation, which prompt the restoration of the ellipsoid zone and outer segments seen on SD-OCT .
To the best of our knowledge, this study is the first to discuss the relation between the IS/OS integrity and color vision. In this study, color vision was improved following each injection, but this improvement was not statistically significant. However, on studying the relation between the IS/OS integrity and color vision, we found that restoration of the foveal photoreceptors (IS/OS) was associated with significant improvement in color vision after administration of intravitreal injections of anti-VEGF ranibizumab (Lucentis) to treat DME. Disc membranes of the cone’s outer segments contain light-sensitive molecules derived from vitamin A. These discs are attached to a cilium, which is embedded through neurotubules in the ellipsoid and myoid of the inner segment. The ellipsoid contains mitochondria and is responsible for the cone shape. The myoid, which is closer to the nucleus, contains endoplasmic reticulum. The mitochondria, cilia, and inner discs together form the IS/OS junction . Therefore, we chose color vision as a parameter to assess the IS/OS integrity. Gualtieri et al. reviewed that early diabetic color vision abnormalities tested by color vision test and full-field electroretinogram are more possibly attributable to generalized neural–glial retinal dysfunction, rather than specific dysfunction of S-cones or the lens, as reported in some previous studies. Impaired color vision is considered as an early sign of neurodegenerative changes. It has been proposed that neural damage possibly precedes clinical DR .
Gualtieri et al. reviewed that early diabetic color vision abnormalities are mostly attributed to generalized neural–glial retinal dysfunction, rather than specific dysfunction of S-cones or the lens, as reported in some previous studies. Impaired color vision is considered as an early sign of neurodegenerative changes. It has been postulated that neural damage possibly precedes clinical DR . This study had several limitations including its relatively small sample size and short follow-up time with recommendation for further studies with larger sample size and longer follow-up time. Photoreceptor IS/OS layer integrity could be an important prognostic indicator of the visual function outcomes in diabetic patients with ME treated with intravitreal injection of ranibizumab. Antonetti DA, Klein R, Gardner TW. Diabetic retinopathy. N Engl J Med 2012; 366:1227–1239. Stitt AW, Curtis TM, Chen M, Medina RJ, McKay GJ, Jenkins A et al. The progress in understanding and treatment of diabetic retinopathy. Prog Retin Eye Res 2016; 51:156–186. Tolentino MJ, Miller JW, Gragoudas ES, Jakobiec FA, Flynn E, Chatzistefanou K et al. Intravitreous injections of vascular endothelial growth factor produce retinal ischemia and microangiopathy in an adult primate. Ophthalmology 1996; 103:1820–1828. Ota M, Tsujikawa A, Kita M, Miyamoto K, Sakamoto A, Yamaike N et al. Integrity of foveal photoreceptor layer in central retinal vein occlusion. Retina 2008; 28:1502–1508. Maar N, Tittl M, Stur M, Zajic B, Reitner A. A new color vision arrangement test to detect functional changes in diabetic macular edema. Br J Ophthalmol 2001; 85:47–51. Sakamoto A, Nishijima K, Kita M, Oh H, Tsujikawa A, Yoshimura N. Association between foveal photoreceptor status and visual acuity after resolution of diabetic macular edema by pars plana vitrectomy. Graefes Arch Clin Exp Ophthalmol 2009; 247:1325–1330. Murakami T, Tsujikawa A, Ohta M, Kita M, Miyamoto K, Sakamoto A et al. Photoreceptor status after resolved macular edema in branch retinal vein occlusion treated with tissue plasminogen activator. Am J Ophthalmol 2007; 143:3–171. Piccolino FC, de la Longrais RR, Ravera G, Eandi CM, Ventre L, Abdollahi A, Manea M. The foveal photoreceptor layer and visual acuity loss in central serous chorioretinopathy. Am J Ophthalmol 2005; 139:87–99. Radwan TM, Ghoneim EM, Ghobashy WA, Orma AA Assessment of color vision on diabetic patient. IJOR 2015; 1:19–23. Bandello F, Berchicci L, La Spina C, Battaglia Parodi M, Iacono P. Evidence for anti-VEGF treatment of diabetic macular edema. Ophthalmic Res 2012; 48:16–20. Mori Y, Suzuma K, Uji A, Ishihara K, Yoshitake S, Fujimoto M et al. Restoration of foveal photoreceptors after intravitreal ranibizumab injections for diabetic macular edema. Sci Rep 2016; 6:39161. 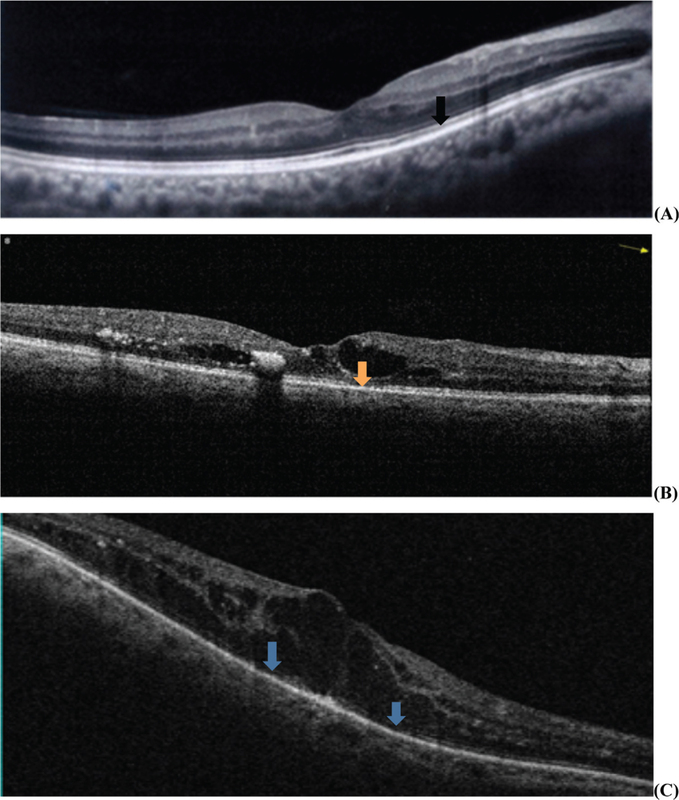 Otani T, Yamaguchi Y, Kishi S. Correlation between visual acuity and foveal microstructural changes in diabetic macular edema. Retina 2010; 30:774–780. Maheshwary AS, Oster SF, Yuson RM, Cheng L, Mojana F, Freeman WR. The association between percent disruption of the photoreceptor inner segment-outer segment junction and visual acuity in diabetic macular edema. Am J Ophthalmol 2010; 150:63–67. Jain A, Saxena S, Khanna VK, Shukla R, Meye C. Status of serum VEGF and ICAM-1 and its association with external limiting membrane and inner segment-outer segment junction disruption in type 2 diabetes mellitus. Mol Vis 2013; 19:8–1760. Kang JW, Chung H, Chan Kim H. Correlation of optical coherence tomographic hyperreflective foci with visual outcomes in different patterns of diabetic macular edema. Retina 2016; 36:1630–1639. Murakami T, Nishijima K, Akagi T, Uji A, Horii T, Ueda-Arakawa N et al. Optical coherence tomographic reflectivity of photoreceptors beneath cystoid spaces in diabetic macular edema. Invest Ophthalmol Vis Sci 2012; 53:1506–1511. Cantor L, Rapuano C, George A. BCSC retina and vitreous. San Francisco, USA: American Academy of Ophthalmology; 2014. pp. 9–12. Gualtieri M, Feitosa-Santana C, Lago M, Nishi M, Ventura D. Early visual changes in diabetic patients with no retinopathy measured by color discrimination and electroretinography. Psychol Neurosci 2013; 6:227–234. Verma A, Rani PK, Raman R, Pal SS, Laxmi G, Gupta M et al. Is neuronal dysfunction an early sign of diabetic retinopathy? microperimetry and spectral domain optical coherence tomography (SD-OCT) study in individuals with diabetes, but no diabetic retinopathy. Eye (Lond) 2009; 23:1824–1830.